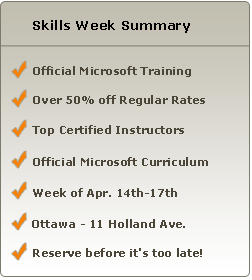 That’s right, Microsoft Skills Week is coming to Ottawa in April thanks to CTE Solutions. CTE Solutions is offering discounted courses for 2008 Active Directory, Hyper-V Server and Updating your skills from SQL 2005 to SQL 2008. 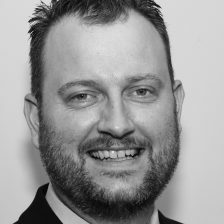 I have booked into the Hyper-V course and have the two corresponding exams booked for the 16th. I figure I should write the exams while the information is still fresh in my head. My boss told me I am a glutton for punishment but she was glad to save some money on the training. At these prices, the courses are going to book up fast so get on it as soon as you can. During the week of April 14th-17th we’ll be hosting a Microsoft Skills Week in Ottawa and you’re invited! Choose from the following emerging technology courses for Microsoft Windows Server 2008 Active Directory, Hyper-V, and SQL Server 2008. Oh and by the way you’ll save over 50% off regularly advertised prices. This 3-day instructor-led course has been accelerated into 2-days with lengthened hours provides Active Directory Technology Specialists an introduction to Active Directory server roles in Windows Server 2008. The course is intended for entry level students who want to get familiar with the Active Directory server roles and their basic functionality. This 3-day course has been accelerated into 2-days with lengthened hours. This instructor-led course teaches students how to implement and manage Windows Server 2008 Hyper-V. It also teaches students how to manage Hyper-V with Solution Center Virtual Machine Manager (VMM) and with PowerShell. Get expert training on Microsoft SQL Server 2008, and get the software as a free offer. In this 3-day course, you will learn to take advantage of the powerful and trustworthy array of new data-driven management solutions in SQL Server 2008. This course is designed for administrators and developers. CTE Solutions delivers – Training with IMPACT!